I've said it before-- mill as a win condition is pretty much dead. Everybody's got either Elixir of Immortality or cards that want them to fill up their graveyards. Trying to dump their library into their graveyards is more likely to help your opponents than hurt them. That said, you can take advantage of that yourself by targeting yourself with this card. There is a reason it targets a "player" and not an "opponent". To pull that off, you'd need to really have your deck chock full of Flashback spells and other cards that cue off your graveyard. Supposedly the idea had some success in Limited with decks based off Spider Spawning, but I've yet to see it work in Constructed. I used to know someone who played a "Mono Blue Burn" deck. Blue got a lot more direct damage in early sets than it does now, so it was surprisingly easy to build. Nowadays, it seems blue is getting burn with its own twist: it directly damages things other than life totals, which in a sense makes it somewhat harder to defend against (make of that what you will). Think of Tome Scour as the blue Lava Spike, Thought Scour as Magma Jet, and Increasing Confusion here as Devil's Play. While milling may still be some way from being accepted as a competitive strategy, it can more than hold its own in a variety of other settings, and Increasing Confusion fits very well in existing milling strategies and may be getting close to being powerful enough to get into more competitive arenas. And you can even target yourself if you need to (you will someday!). Welcome back readers todays card of the day is a powerful mill card that allows a double dose of milling for X. This could make an interesting finisher card as even if it is countered you can then flash it back and double mill them. In standard mill decks haven’t seen a lot of success in a while and I don’t think this will change with the release of Dark Ascension mill decks just aren’t competitive and outside of maybe a win condition of a control deck I don’t see this card seeing much play. In extended and modern the same concept applies making this card is not quite powerful enough to make an impression on such a fast format. In legacy and vintage this card is absolutely too slow except maybe outside an infinite mana combo but blue sun zenith may be a better choice there. In casual and multiplayer this card will be popular as mill is popular and the tools are there to make it work in multiplayer such as Keening Stone from Zendikar block. In limited mill is actually a viable strategy and this with enough mana can kill an opponent in a turn or two making it an interesting yet viable niche strategy. Overall a powerful mill card but the power level of mill may hold it back. 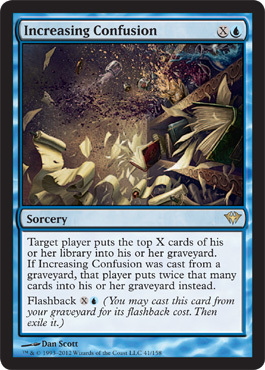 Today's card of the day is Increasing Confusion which costs X and one Blue to cast or Flashback to have target player put the top X cards from the library into the graveyard and if cast from the graveyard it puts twice as many instead. This is a nice card for decks that need to fill the graveyard quickly and works well for support or a finisher in a deck destruction build. Overall a solid addition to either strategy and having the X and Flashback make it flexible for any stage of the game. For Limited deck destruction is rarely viable, but if used twice with a large supply of mana this can almost win a game with no support. That alone makes it playable and if anything that requires cards in the graveyard is in your pool it does add another possible use should deck destruction not be on the table. If playing some Blue or mana acceleration it is probably worth a slot in Sealed and can be a viable first pick in Booster, despite being a bit less impressive than other rares. Welcome to the final card of the day review of the week here at Pojo.com! To close this week out we are looking at Increasing Confusion from Dark Ascension. Increasing Confusion is a rare sorcery that costs a blue mana and X. Target player puts the top X cards of his or her library into his or her graveyard. If Increasing Confusion was cast from a graveyard, they put twice that number into the graveyard. The flashback cost is one blue and X. No doubt one of the most ridiculous cards from the set. Milling ahs always been a popular strategy, and this only makes it more desirable. Milling an X value is nice, but when the potential for twice that value is added in, it is only that much nicer. There is plenty of mana acceleration, especially from Dark Ascension towards the flashback cost. Not worth wasting time to describe how nice this card is, and how actually amazing it is.